The Philippine government has just acquitted the daughter of a drug queen sued for 5 million pesos worth of shabu (crystal methamphetamine) but has deported a nun, Sister Patricia Fox, doing missionary work in the country. Diana was arrested during a raid on her condominium unit in San Miguel, Manila near Malacañang hours after authorities recovered P5 million worth of shabu and bank checks in her mother’s cell at the Correctional Institution for Women (CIW) in Mandaluyong in November last year. An Australian nun who had criticized President Rodrigo Duterte’s policies, including his brutal war on drugs, arrived home from the Philippines on Sunday, more than six months after the president ordered her arrest and deportation. Fox, mother superior of the Our Lady of Sion congregation in the Philippines, has been in the country for 27 years, has worked mostly with the urban poor, indigenous peoples, and farmers. At the time of her arrest, she had just joined an international fact-finding and solidarity mission investigating alleged rights abuses in Mindanao. According to a report by Newsweek, Fox had joined protests against the killing of farmers in Mindanao. 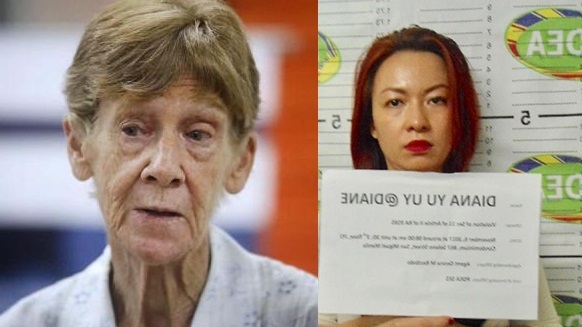 Australian missionary Patricia Fox has been on the headlines since she was detained by the Bureau of Immigration upon orders of President Duterte for having a “foul mouth” and alleged “disorderly conduct.” What exactly has the 71-year-old nun done during the 27 years she has been in the Philippines to incur the wrath of the administration?